We ran our Introduction Day to Elder Mediation, which was attended by 7 trained mediators at the Avila Centre in Morehampton Road, Dublin 4. The course was given by Frances and Brian. The Elder mediation World Summit was held in Bristol. Later Life Mediation was represented by Helen (in her capacity as Chairperson of EMIN), Frances and Brian. All three gave presentations to the conference. Frances Stephenson gave a talk to students of the Masters in Education and Well Being of Older Person course in Mary Immaculate College, Limerick on the topic of Elder mediation. 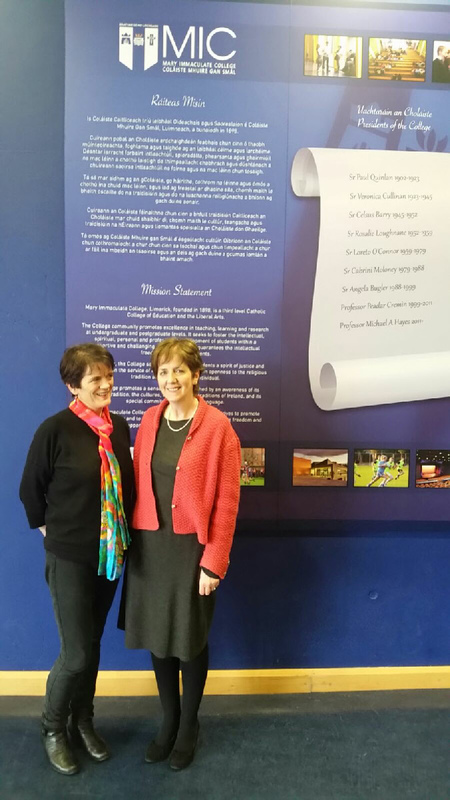 Frances is pictured here with the programme co-ordinator, Liz Early. We ran our Introduction Day to Elder Mediation, which was attended by 16 trained mediators at the Avila Centre in Morehampton Road, Dublin 4. The course was given by Frances and Brian. Later Life Mediation has announced the holding of two further courses on Elder Mediation, which are aimed specifically at mediators who wish to deepen their knowledge of this specialism. 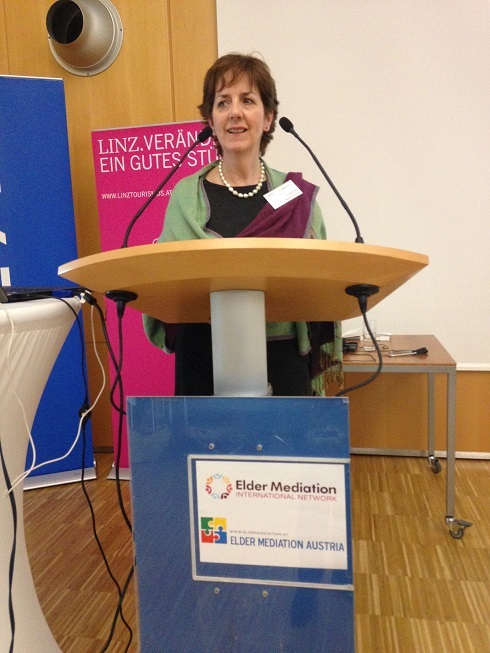 Both Helen and Frances addressed the Elder Mediation World Summit in Linz, Austria this month. Helen talked in her capacity as Chairperson of EMIN and Frances presented a paper. Later Life Mediation has announced the holding of three courses on Elder Mediation, which are aimed specifically at mediators who wish to deepen their knowledge of this specialism. On September 30th, we ran our Elder Mediation Training Day 2 . This is an other step on the road to EMIN accreditation for those who were interested in being certified Elder Mediators and a further insight into the issues being addressed by Elder Mediators. We intend to hold further training days, probably in the spring of 2016, to further enable people to work towards accreditation. There was an excellent turn-out for our Elder Mediation Training Day 1. The feedback was very positive and we are very much looking forward to our Elder Mediation Training Day 2, to be held on September 30th. This day will be of value to those who have already had an introduction to Elder Mediation. Later Life Mediation has announced the holding of two courses on Elder Mediation, which are aimed specifically at mediators who wish to deepen their knowledge of this specialism. The MII wishes to congratulate Helen Harnett on her appointment as Chair of the Elder Mediation International Network (EMIN). EMIN promotes standards and ethics in Elder Mediation through its international certification programme and Code of Practice. It also promotes Elder Mediation worldwide through World Summits which are well known to the many MII members who attended the 2009 World Summit in Dublin. At the 7th World Summit on Mediation with Age Related Issues in Halifax, Nova Scotia in June this year, it was announced that the next World Summit will take place in Linz, Austria from May 2 to May 4, 2016. Helen served on the MII Council from 2009 to 2013 and is a founding member and Director of Later Life Mediation. She can be contacted at helen@laterlifemediation.com and 087 2482601. 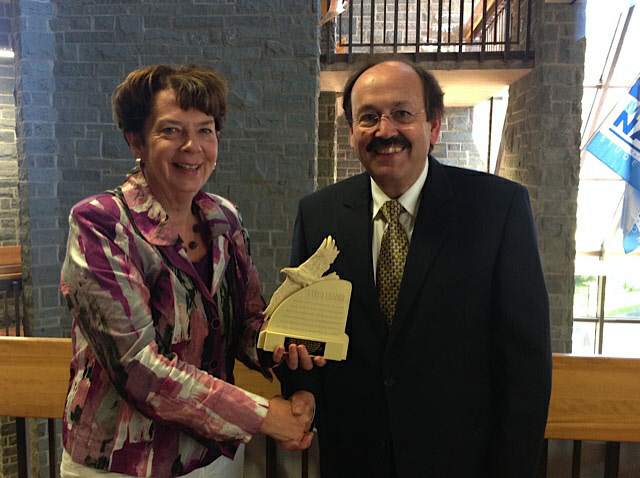 The attached photo is of Helen Harnett presenting the Sherren Leadership Award to Greg McCann Beranger at the 7th World Summit in Halifax, Nova Scotia on June 26th this year. Helen Harnett and Brian O’Neill presented a day-long workshop on ‘Ageing in Families’ in Milltown Parish Pastoral Centre. Helen Harnett and Brian O’Neill presented a day-long workshop on ‘Ageing in Families’ in Milltown Parish Pastoral Centre. It was well attended and the feedback was excellent. Two of our mediators, Frances and Joe, presented a workshop on Elder Mediation at the Caring for the Carers Conference held in Westport from March 1st - 3rd 2013. 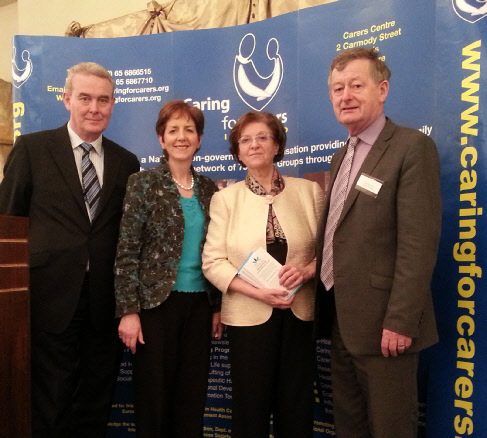 Joe McDermott (LLM), Frances Stephenson (LLM), Mary McMahon (CEO of Caring for the Carers), Pat Shannon (Head of Services of Caring for the Carers). Three of our mediators presented a seminar at the 14th Annual Mediators’ Institute of Ireland Conference in November which was held last week. The topic was ‘Sensitising Mediators to Elder mediation Issues’. 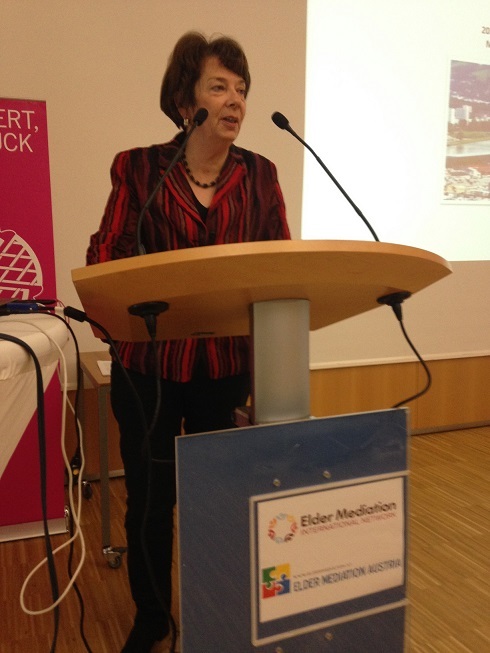 The purpose of the seminar was to raise the profile of Elder Mediation and to share what we have learned to-date. Four of our mediators were awarded their internationally-accredited Certificates in Elder Mediation at the World Summit on Elder Mediation in Glasgow. This is a major achievement and we are among the first in Europe to achieve this status. The Later Life Mediation mediators attended the Mediation Institute of Ireland (MII) Annual conference at the Grand Hotel in Malahide. Claire Kearney co-presented one of the workshops. The conference was attended by over 165 delegates, demonstrating the growing awareness of mediation in Ireland. Frances Stephenson and Brian O’Neill were interviewed by The Bray People newspaper. They were asked about Elder Mediation in Ireland in general and about Later Life Mediation in particular. The interview can be accessed by clicking below.